Demand response is a tool to balance the grid. With demand response, buildings can adjust their electricity consumption based on the grid’s status and get rewarded for it. The building’s mass acts as energy storage, thus HVAC-processes are possible loads to be controlled. There are also other options, such as lighting. Control of these loads must be within some limits, for example occupants in the building won’t like it if the indoor temperature gets too high. Because Nuuka can analyze and monitor all the building data (such as indoor temperature and CO2 levels) it can control the loads and keep occupants satisfied. There are different methods for demand response, which can be roughly divided into: peak demand limiting, load shifting and grid balancing. With peak demand limiting, buildings can limit the peak demand of some hours and make the consumption profile smoother. In load shifting, consumption from expensive hours is shifted to cheaper hours. Grid balancing is the most difficult method but also the most profitable. Grid balancing is when the loads react to the status of the grid almost in real-time and controllable capacity of the loads is sold to different energy markets. Nuuka is targeting these markets, because the data being collected helps Nuuka to develop a software for demand response. In total, demand response helps make for a more efficient electrical grid by adjusting consumption in buildings. 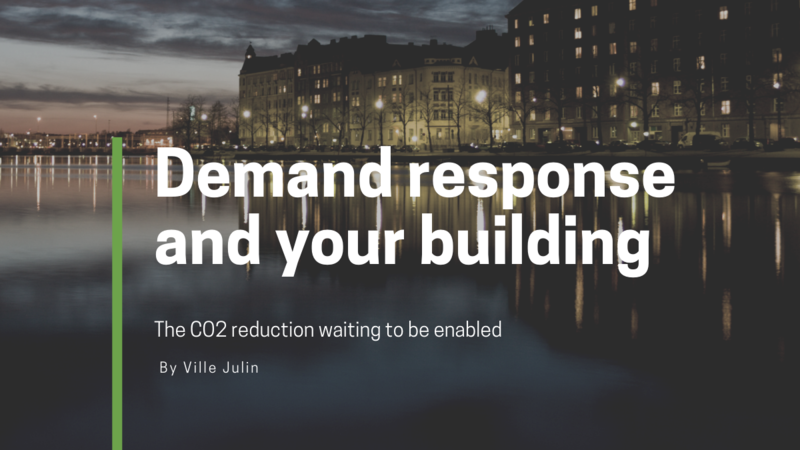 Demand response is a technological solution that helps buildings cut CO2 emissions. In 2013, the European Commission noted that the 'potential of demand response at the Union scale is enormous' and that peak demand could be reduced by 60 GW, which is approximately 10% of the EU's peak demand. The need for demand response grows all the time due to the increase of intermittent renewable energy in the electricity mix (such as wind and solar), which makes electrical grids more unstable due to weather uncertainties. Now, roughly 2500 buildings are connected to Nuuka in Finland, which gives Nuuka a great opportunity to make an impact environmentally and financially by helping buildings provide demand response to their local electricity grids.